Twenty-two years after he was shot, Italians still keep a little American boy in their hearts. A few weeks ago an emotional email arrived from southern Italy from people we had never met. 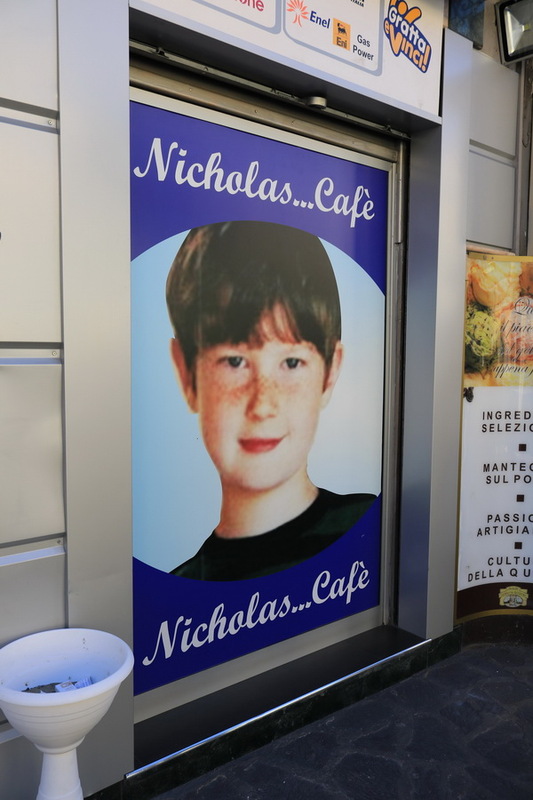 They are the Santangelo family, who — after our seven-year old son Nicholas was shot in an attempted carjacking in southern Italy and his organs and corneas donated to seven Italians — had opened a coffee bar named for him. Now they were telling us they had three bars, all of them named Nicholas, and were inviting us to visit them. They seemed to think of him as part of their family. One of the young men in the family has the word Nicholas tattooed on his arm. Their business cards have his face on them. As it happened, I was giving a talk to the Italian Transplantation Society soon after and my friend and tireless worker for the cause of organ donation, Andrea Scarabelli, who lives in Rome, offered to drive me to Naples. On the way down, we called ahead. When we arrived at the first location the whole family was waiting on the sidewalk, the men looking serious, some of the women in tears, the children fidgeting with excitement. Immediately we walked into the group, we were engulfed in hugs and smiles and more tears, some of them mine. Inside we were given steaming cups of coffee, so concentrated in the Italian style that they barely covered the bottom of the tiny cups. I asked for a Café Americano, much bigger, though still only a juvenile version of the mug I use at home. I felt like a sissy, as if I’d asked for Miller Lite in an Irish pub. With the exquisite tact that Italians of all walks of life show to strangers, they did not press me with questions about Nicholas but nevertheless, seeing that they seemed likely to burst with curiosity, I told them stories about him, and that Eleanor, his sister, the four-year old who was sleeping next to him on the back seat of the car when he was shot, is now a 26-year old teacher; that Maggie, my wife, is the costumer for an opera company; that our twins, born two years after the shooting, are at college; and that the drought in California has shriveled up our lawn. In short, it was like visiting friends I’d known for years. 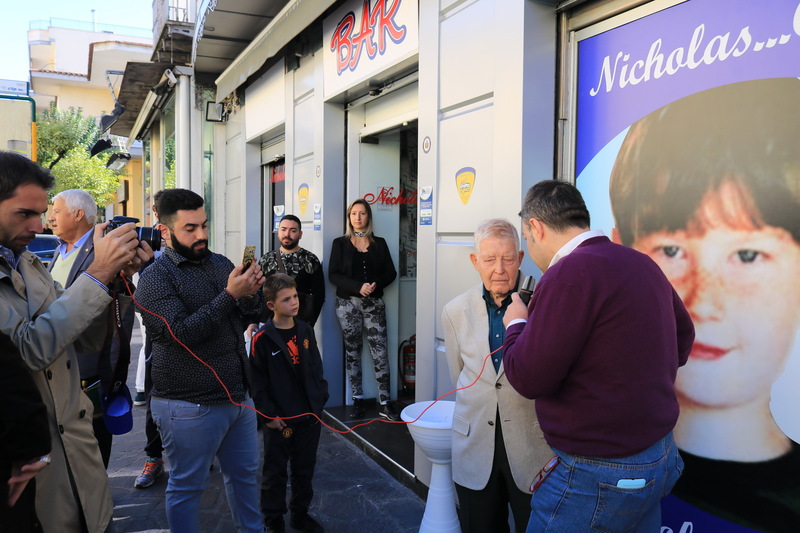 The mayor of the little town, a suburb of Naples, came too and Dr. Giusy de Rosa, whom I met when she was a teacher at the Nicholas Green Primary School in a nearby town. A renowned nephrologist was also there, Professor Emeritus Natale de Santo of the Second University of Naples, who has done everything he can to help make transplantation an essential part of medical study. This was an opportunity, they all felt, to draw attention to the urgent need for organ donation in an unusually persuasive setting. None of the three locations is grand, just the traditional meeting places of locals where, along with the weather and the upcoming soccer match, the story of a small American boy whose donation changed the thinking of a nation would be told over and over. “Why did you call it Nicholas?” young people often ask, one of the family told me. “When I tell them the story, they look him up on the Internet,” he added “and, when they come back the next time, they know more about him than I do.” Including, no doubt, that in the 10 years after he was killed organ donation rates in Italy, until then the lowest among comparable European countries, tripled (!) so that thousands of people are alive who would have died. There are many ways to spread the message of organ donation. To me this kind of spontaneous grassroots growth is the most satisfying of all.